Ahh, it's the end of another year. Time to reflect on the year that was, and look forward with hope and optimism toward the one to come. I don't know about you, but I am so over 2013 - bring on 2014! Momentum has been building throughout 2013 for just such a year: ethical fashion retailers are popping up left and right; cutting-edge, sustainable designers are on the rise; and there has been a huge increase in awareness amongst fashion lovers about where their clothing is made. I know we all agree that we simply cannot accept another tragedy like the horrific Rana Factory fire and collapse in Bangladesh, which killed over 1,100 people and injured thousands more. So again I say, bring on 2014. And bring on a global commitment to earth- and human-friendly fashion. To commemorate this first 'official' year of sustainable fashion, I'm excited to share with you some news of my own. In February I will be releasing the second edition of Sustainability with Style - available in print for the first time, and including a brand new shopping guide. In March I begin my PhD examining sustainable fashion and its role in environmentalism. In April, my team and I will be launching Clean Cut, the future of Australian fashion. And that's just the start of the year! Of course I'll continue to bring you the latest in sustainable fashion, natural beauty and eco-living here on the blog. So who's with me? Who will join me in ringing in a fabulously fashionable (and sustainable!) 2014? Until then, I hope you enjoy what's left of 2013. Pull out a favourite party frock, put on your brightest (eco) lippy, and dance the night away. From my heart to yours, I wish you a beautiful New Year. P.S. 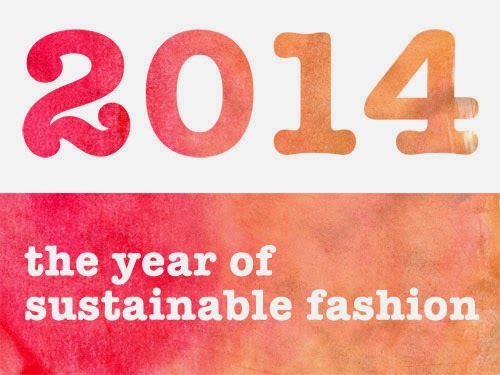 I'd love to hear what you get up to to commemorate the year of sustainable fashion. One great idea comes from fellow blogger Pip Lincolne from Meet me at Mikes, who is committing to a year of ethical fashion in 2014. I can just tell this year's going to be amazing. Hi, great to see you doing this! have posted on this issue on my blog a couple of times in the past - will try to do it more frequently this year now that you (and Pip) have brought it into the spotlight. Thanks for writing! And great to hear you'll help keep sustainable and ethical fashion in the spotlight this year. Looking forward to. Big changes this year!